I wrote a simple opencl program, but when I use printf debug kernel code, app hang, but comment on printf code, app get correct result. my os: win7, amd app sdk 2.7, my display card: redwood. I rember before, not this issue in sdk 2.3, bug? who can help me test it? 1>gclFile.cpp(14): warning C4996: 'fopen': This function or variable may be unsafe. Consider using fopen_s instead. To disable deprecation, use _CRT_SECURE_NO_WARNINGS. See online help for details. 1>gclFile.cpp(31): warning C4996: 'fopen': This function or variable may be unsafe. Consider using fopen_s instead. To disable deprecation, use _CRT_SECURE_NO_WARNINGS. See online help for details. you can build a solution or project for it, or you can give me your mail, I will send solution to you . That's what I did. Would you mind upload it again? So that everybody else can try it too. I downloaded the zip file. Deleted the projects other than gclTutorial4. Since it fails compilation, I added the additioninclude/library path in order to use the opencl head file. I still get the following error. I am using A6, win7, vs2010, sdk 2.7 and the latest driver. 1>Build started 9/11/2012 3:26:41 AM. 1>c:\users\tan_mcw\downloads\gcltutorial\gcltutorial\gcltutorial4\gclfile.cpp(14): warning C4996: 'fopen': This function or variable may be unsafe. Consider using fopen_s instead. To disable deprecation, use _CRT_SECURE_NO_WARNINGS. See online help for details. 1>c:\users\tan_mcw\downloads\gcltutorial\gcltutorial\gcltutorial4\gclfile.cpp(31): warning C4996: 'fopen': This function or variable may be unsafe. Consider using fopen_s instead. To disable deprecation, use _CRT_SECURE_NO_WARNINGS. See online help for details. 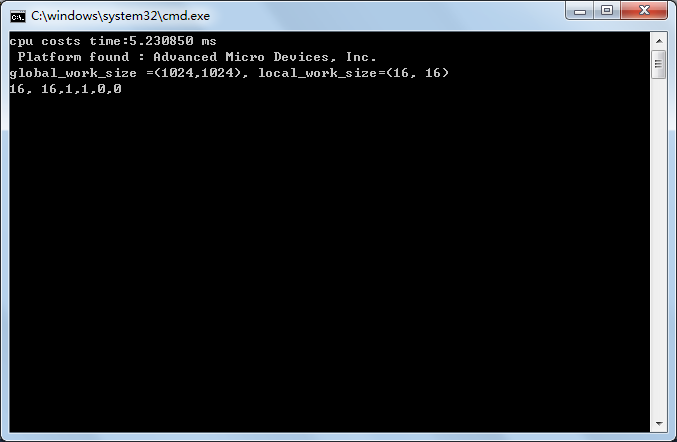 I have placed "#pragram opencl.lib" in main.cpp, so you only need to add lib directory in vs2010. -> Enable Incremental Linking -> "No (/INCREMENTAL:NO)"
I am using A6, sdk 2.7, the latest driver and win7.